In the history of classical realism, we do these intense studies in black and white first to truly understand "shapes - values & edges" before even touching anything in color. In the training at The Atelier most students spend their entire first year in charcoal, then moving into black and white oil. These studies can take many months to complete. A very important lesson in training ones eye. 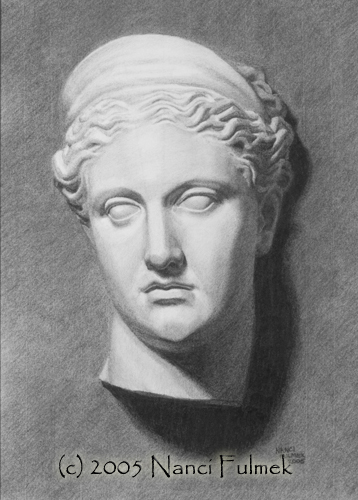 This is my study of a head cast in charcoal on white paper. NOTE: Image may appear differently depending on your monitor. To see the drawing, call me to make an appointment at my studio. I’d love to have you over!